Ships FREE to 48 states! With a one-of-a-kind approach that offers more comprehensive coverage than any other plumbing apprentice book on the market, this valuable resource will thoroughly prepare readers for the transition from the residential plumbing industry to commercial or industrial projects. 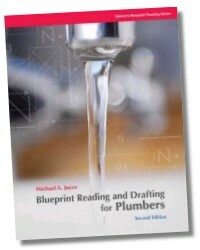 Blueprint Reading and Drafting for Plumbers, 2E goes beyond basic lessons on reading and drafting various piping arrangements to provide highly detailed, practical, and relevant information that addresses the real-life demands of commercial and industrial job sites. This updated edition features all-new chapters devoted to coordinating plumbing installations using structural steel and civil blueprints, further enhancing the book’s unique and jobsite-focused classroom lessons. Michael A. Joyce is a Class 1 licensed plumbing contractor in North Carolina, with 29 years of plumbing experience in commercial, industrial, and residential installations and repairs. He has authored several plumbing books and teaches a variety of plumbing seminars and classes throughout the country, including the United States Pentagon and New York City hospitals. Currently the President of Joyce Company, Inc., Mr. Joyce is also the owner of the Plumbing Education Station.